Luv Betsey Wristlet Crossbody Wallet. Exterior features heart stitched detail, detachable crossbody strap. Interior features zip pocket, three slip pockets, 8 credit card slots. detachable wristlet strap, front logo plate, gold tone hardware. 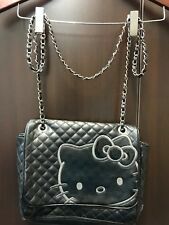 Hello Kitty Black Patent Quilted Purse By Sanrio Purse has a few scuffs but in really nice condition per pics. Thank you for looking,please checkout my other listings. 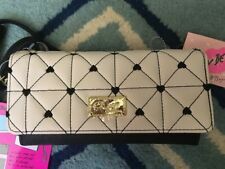 LUV BETSEY by Betsey Johnson Wristlet X-Body Wallet. Crystal Evening Bag. Material:swarovsko crystal diamond. Accessories: short chain 52 cm. If you want to receive it faster. THE STRAP IS DETACHABLE SO THE BAG CAN BE CARRIED AS A WALLET OR CLUTCH. THE EXTERIOR OF THE BAG IS DECORATED WITH RHINESTONE CAT EYES, FAUX LEATHER EARS, THREAD WHISKERS AND A GOLDTONE BETSEY JOHNSON HEART-SHAPED NOSE. "Whiskered Cat" Collection. Charming "Whiskered Cat" crossbody. Authentic Laurel Burch. As always with Laurel Burch. Zip top closure with trademark Laurel Burch cat zipper pull. Wear crossbody for more security.